The 250 MW Cedar Point wind project in Colorado brought home the benefits of alternative energy projects, with some $500 million injected into the state's economy. All of the 139 1.8 MW Vestasturbines used on the project were manufactured in Colorado. The 139 V90-1.8 MW Vestas turbines used on the Cedar Point project were manufactured in Colorado, at Vestas plants in Windsor, Brighton, and Pueblo. 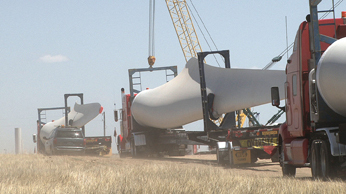 Vestas has opened these manufacturing facilities in Colorado to provide wind turbines for North American customers. The recently completed Cedar Point wind project in Colorado is one of the best examples of the economic benefits that alternative energy projects can bring to both a community and to a state. The 250 megawatt project, developed and built by Renewable Energy Systems Americas Inc. (RES Americas), and now owned by energy company Enbridge Inc., generates enough clean electricity to meet the needs of approximately 80,000 homes. Power generated by the project is being purchased under a long term contract with the Public Service Company of Colorado, a subsidiary of Xcel Energy. The benefits include the injection of some $500 million into the Colorado economy, creating more than 365 construction jobs in the town of Limon, Colorado, where the project is located, and close to 25 full-time jobs now that Cedar Point is operational. An added bonus, however, is that the 139 V90-1.8 MW Vestas turbines used on the project were manufactured in Colorado, at Vestas plants in Windsor, Brighton, and Pueblo. Vestas has opened these four manufacturing facilities in Colorado to provide wind turbines for North American customers: a blades factory in Windsor, a nacelle-assembly factory in Brighton, a second blade factory, also in Brighton, and a tower manufacturing facility—the world's largest—in Pueblo. RES Americas is also based in Colorado and is a renewable energy success story in itself. RES Americas is a fully-integrated renewable energy company that develops, constructs, owns, and operates projects across North America. With Cedar Point, the company has constructed, or has under construction, more than 5,500 MW, which represents approximately 10 percent of the operating installed wind capacity in the U.S. RES Americas has a further 9,000 MW in development. The Cedar Point Wind Power Purchase Agreement is the first to be completed from the 2007 Colorado Resource Plan by Public Service Company of Colorado. "The project will expand the utilization of Colorado's desirable wind resource into another region of the state to deliver this clean wind energy to our customers," said Tom Imbler, vice president of commercial operations for Xcel Energy, which owns Public Service Company of Colorado. "Not only will this project help us meet our Renewable Energy Standard for Colorado, it will be our first wind energy purchase from a facility constructed in Colorado with wind turbines manufactured in Colorado." RES Americas has been working on the Cedar Point project for some time, explains ShaliniRamanathan, RES Americas vice-president of development, South Central. "We have been working on Cedar Point for 10 years," she says. "What first caught our attention with Cedar Point is that it's a very windy site. It stands out on a topo map, with good wind qualities." Also important is the availability of transmission capacity. That feature is becoming increasingly important to wind project developers—sites with easy access to transmission facilities are becoming increasingly hard to find. Most of these sites, "low hanging fruit" when it comes to the ease of a transmission hook up, have already been developed. As the wind power industry is discovering, having tremendous wind resources is one thing; but if there is no economical way to move wind power to major load centers, the business case for a project can quickly become shaky. RES Americas used county roads in a limited way with the Cedar Point wind project. The company built 32 miles of new roads as part of the project. "One of the things that made Cedar Point attractive to us was that we could build a line to the Missile Site substation, which connected to a 230 kV Public Service Company transmission line," explains Ramanathan. "The substation was already there, and we knew it was going to be upgraded." Essentially, the Cedar Point site stood out for having both a combination of wind speed and the availability of transmission. Added to that, says Ramanathan, is that Colorado itself, which is lightly populated in many areas and has lots of open land, lends itself to wind project development. "You also have utilities in Colorado that are very interested in procuring wind power. Colorado's commitment to renewable energy makes it a great place to develop projects." The 20,000 acre site is made up primarily of privately owned farm land, with some ranch land. The site, which runs between Lincoln and Elbert counties in northeastern Colorado, has a ridge line. "The ridge is subtle, though," says Ramanathan. "It's not like what you would see on a wind project in the Pacific Northwest, for example." Not to overstate the situation, but RES Americas ran into far more YIMBY (Yes, In My Backyard) forces locally regarding Cedar Point Wind than it did NIMBY folks. "Cedar Point has always enjoyed really strong support from the local community. The local Economic Development Office was engaged from the start of the project right through to the ribbon cutting, and the county was very supportive on the permitting." As with all of its projects, RES Americas carried out environmental studies on the Cedar Point site. These included standard avian and bat studies, site characterization studies, and phase one environmental site assessment for hazardous materials. "There were several years of studies, and we coordinated very closely with the Colorado Division of Wildlife, and met with U.S. Fish and Wildlife. One of the good things about developing a project over a number of years is that you understand the site very, very well," says Ramanathan. As a result, they knew very well where the best locations were for turbines on the site. 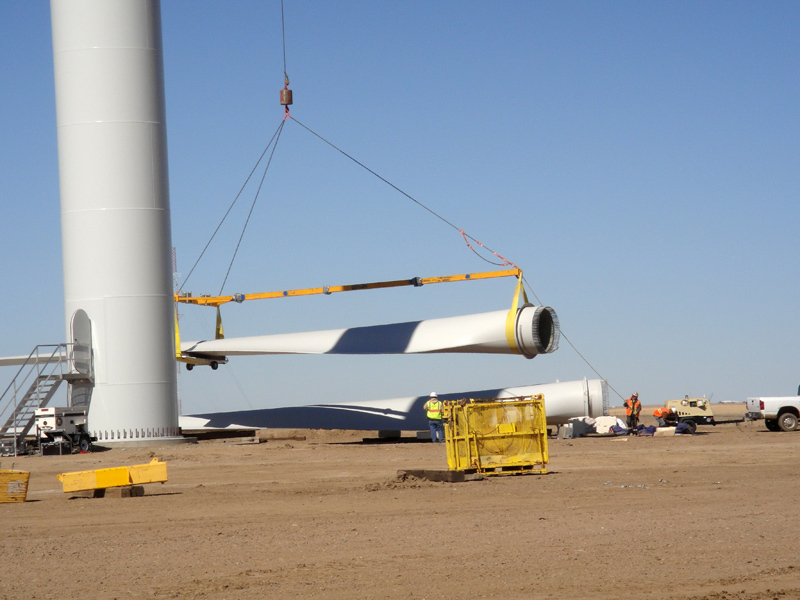 "We worked on turbine location layouts consistently throughout the development cycle, and we evaluated lots of different turbines before going with the Vestas equipment. We probably did half-a-dozen different layouts with the different turbines we were evaluating." The company is satisfied with its choice of the Vestas turbines, said Ramanathan. "They are great turbines—they gave us the kind of energy yield we needed to deliver a competitive price to Public Service Company of Colorado. And we're really pleased to work with Vestas because the turbines were manufactured in Colorado, and we're a Colorado-based company. It was a great thing to do for the state because it maximized local content." Having the wind turbines manufactured in Colorado, with a short shipping distance, was a distinct advantage. Local manufacturing of the turbines generally meant they were better able to control deliveries and get turbines on site. Ramanathan said that with a 250 MW project, it's possible to achieve some good economies of scale, both on the development side and construction side. "I think smaller wind projects can take just as much effort as large projects, but it's really satisfying to see something that big happen from the effort we all put in as a company." At a certain point with any wind project, the development folks at RES Americas hand over the project to the construction folks in the company. But they still work together, she noted. "At RES Americas, we really are a fully integrated operation," she explained. "Our construction people were involved on the site and visited a number of times during development, and helped with the micro siting, and helped with the turbine layout and the bid, many years prior to Cedar Point starting construction. "And then once it did move into construction, the development people at RES Americas stayed involved as questions came up about certain setbacks or it involved talking to landowners. While there is a transition from development to construction, we are fortunate to have construction and development both involved at RES Americas, to varying degrees, through the whole process." This is where the benefits of being an integrated company become most apparent. "We believe that the integrated approach of having construction involved at the beginning of the development cycle and developers involved when the project gets under construction, leads to a better project. "We're working on wind project sites that can be complicated. We're now working on one site that has oil and gas infrastructure, and it's really useful from the development side to have the construction people visit and guide us on how best to develop a layout that works. I think it's a key strength for RES Americas that construction plans for our sites are much better developed than if we were simply relying on third party bids for construction." Such multi-use sites are going to become more common in the wind power industry. "But I think the multiple use of land is one of the great strengths of wind power," she added. "After an intense construction period, wind power is compatible with other uses. We have had many projects where once construction ends, farming, ranching, hunting, all that carries on." The industry as a whole needs to realize that it is going to be dealing a lot more with multiple use locations. Although the weather in this part of eastern Colorado can be notoriously bad, it was not a factor on construction of Cedar Point. This area of the state can experience the full range of western U.S. weather, from snowstorms to tornadoes. "The weather was really good to us on Cedar Point," says Jason Zingerman, vice-president, construction projects, northwest, for RES Americas. "The weather allowed us to get ahead of schedule with construction and stay ahead of schedule through the project." RES Americas was able to finish the Cedar Point project ahead of schedule, thanks to some good weather. The company credits the overall success of the project to the teamwork between RES Americas, their client, and the subcontractors. Zingerman said that in planning the construction of a wind farm, the weather is one of the key factors in determining the schedule. "We were fortunate, but we also planned the schedule right so that when the rain came, we already had our roads built." The only roads in place to work with were the county roads, he says. "We basically started from scratch. We used county roads in a very limited way. 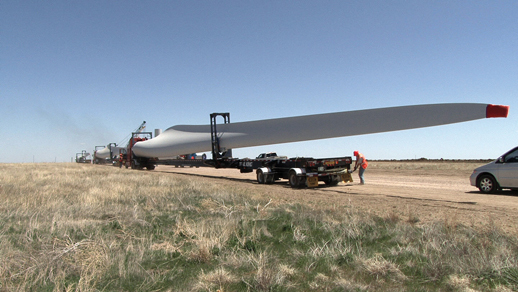 We used very short stretches to get from one section of the wind farm to another, but we built 32 miles of new roads." As with all wind construction projects, there is a need for large quantities of construction materials. "One of the biggest challenges for the project was the aggregate we used for the roads. We had about a 100 mile haul, to bring it in from Morrison, Colorado." About 12,000 truckloads, or a staggering 270,000 tons, of aggregate were required. With a $500 million, 250 MW project, they were able to achieve some economies of scale, he said. "The size contributes to the project becoming more of an assembly line. You definitely gain efficiencies with this kind of scale. It allows you to do things, like a 42-mile transmission line to tie it to the grid, that you wouldn't want to do with a smaller project." He noted they had daily plan-of-the-day meetings with contractors and the client to discuss issues, and they tried to keep things a bit flexible to deal with the different developments on such a large project. "But it's really all done in a planned fashion on a big wind farm such as Cedar Point. You're moving from one turbine to the next. You do the foundations, the rebar, pour the concrete, and the crew ahead is doing the rebar for the next foundation." They had all the foundations done before the turbines were delivered, allowing them to better manage on-site traffic. Having the turbines manufactured in Colorado, with a short shipping distance, was a distinct advantage. "We took some turbines prior to starting erection, so we'd have a bit of backlog on site," said Zingerman. "But because the turbines were manufactured in Colorado, we were better able to control deliveries and get turbines on site. We got the turbines quite quickly and got them on site ahead of needing them. 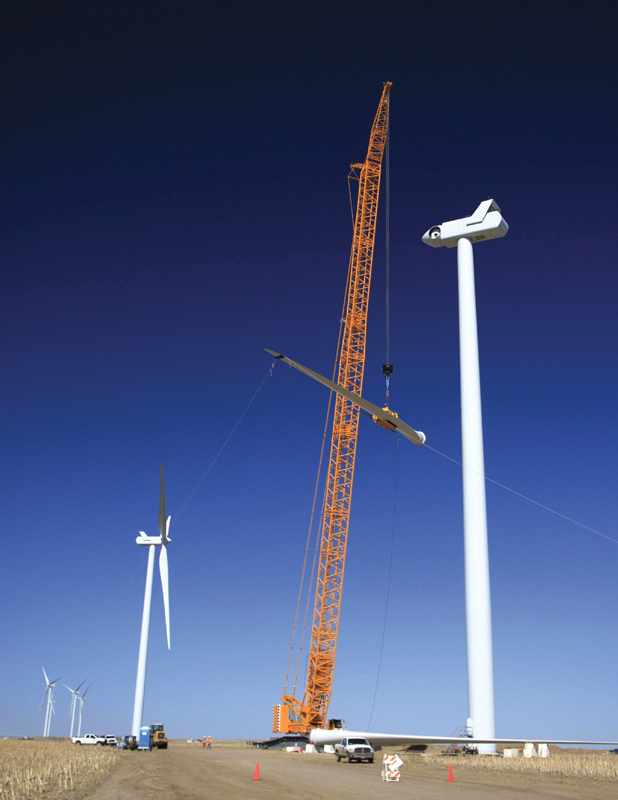 We did not have any situations where we were waiting on a turbine to do the erection." The good weather they had during construction was one of the main reasons why RES Americas was able to finish the project ahead of schedule. But there were other reasons, says Zingerman. "I think the key to the success of the whole project was the teamwork and the atmosphere between us, our client, and our subcontractors. If you're ahead of schedule on a project, it takes a team effort. Otherwise, if you get ahead on one aspect, and if another contractor decides not to stick with the ahead of schedule effort, you can just slip back to where you were before." RES Americas selected local and Colorado companies for a good part of the construction work. Zingerman also credited the development folks for being a key part of completing the project ahead of schedule. "We developed this project, and you have to give a lot of credit to our development people for giving us construction guys a fully baked project, that was ready to build. One of the keys to success on any wind project is good development and having it ready to build so you don't run into any snags along the way." As with his colleague, ShaliniRamanathan, Zingerman believes there are solid benefits to a project being done by an integrated company, such as RES Americas. "Our developers and construction people work hand-in-hand on the issues that will affect us down the road. After the turnover of the project to construction, I have access to developers, permitters, environmental specialists who can follow up on any development issues along the way. "We feel that is exactly the value add of RES Americas," he said. "With everything from the wind resource on the site to the land leasing to the permitting agency involvement, equipment procurement, on into construction, and, in the case of Cedar Point, the operations of the wind farm, we're all right here, in one building." A final point that Zingerman added is that the project was carried out with high safety standards. "We are really proud of our safety record on Cedar Point—it was a safety success."